@Aliefc: I didn't keep notes on that, sorry. I need this list in text file to print it but I can't do copy/paste like I did in previous seasons. Lewis Gibson is not Spanish. @OohAhCantona: I've compiled another list for bargain wonderkids and other U21 talents. That list has an "asking price" column. Not sure how you compile this list, but if I'm allowed to dream... adding asking price would be amazing. The "value" is not even remotely close to asking price for some of these guys, I approached a number of teams for guys valued under 1M and was quoted 100M+ for a few guys. 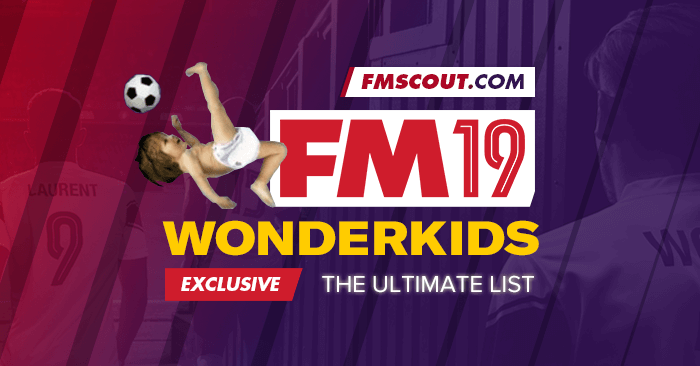 Do you have a file for download, with all the wonderkids above in it? Added a couple of players today to reflect changes in 19.1 data. Will revise my list again during the weekend to ensure there will be no mistakes. @welschace: I'd hope so. I assess players based on their PA and attributes in the database. Sometimes a -75 PA player can be close to a -8 one; maybe even get a higher random PA. And when that happens, people will naturally wonder why he's not listed here. People are aware Stam doesn't rate the players in the database right? he has no control whether a player is a -75 etc? @zazalo: The color is a hint for the player's PA. Gold > Green > Blue > White > Purple. The PA alone doesn't guarantee the player will be great though. Ratings are my personal opinion of how good the player can become on average. By saying "on average", it means that I try to calculate his average PA in case it's a range (negative) and not fixed. For example, if player has -9 (150-180) my rating will reflect 165. And remember that in your save, a player with -85 (140-170) could get 160 PA and a player with -9 (150-180) could get 155 PA. Which explains why I aim for the average value in such cases. Now to answer why Odsonne's media description is "wonderkid" and Arp is just "striker" at the start of the game. The "wonderkid" word is given to players under-21 who have sufficient CA (130+ I believe) as well as 150+ PA. Odsdonne starts with 135 CA and has 155 fixed PA. Arp starts with 118 CA and has 167 fixed PA. He's 2 years younger than Odsonne, so you should expect Arp to become a better player. Odsonne has 79 points and blue colour..
Arp Fiete has 86 points and green colour. Stam you are saying with these colours, Fiete's Potantial ability is better right? But when i scouting these players, in Odsonne's profile writing 'wonderkid' . But in Fiete's profile is not writing anything like 'wonderkid'. i noticed this on some other players too. Some of players in your list in white or light purple, could be better develope than light gold, light green and light blue? @FCE: Jonathan David is -75. Just a quick correction, Borja Garces (ST) plays for Atlético de Madrid, not Real Madrid. Where's Robbie Keane? Won the UEFA European Under-18 Championship with the Republic of Ireland back in 1998. But SI put more than hundred U21 midfields before him . Jean-Clair Todibo needs to be a wonderkid too, titular centre-back at 18 yo since 8 games. 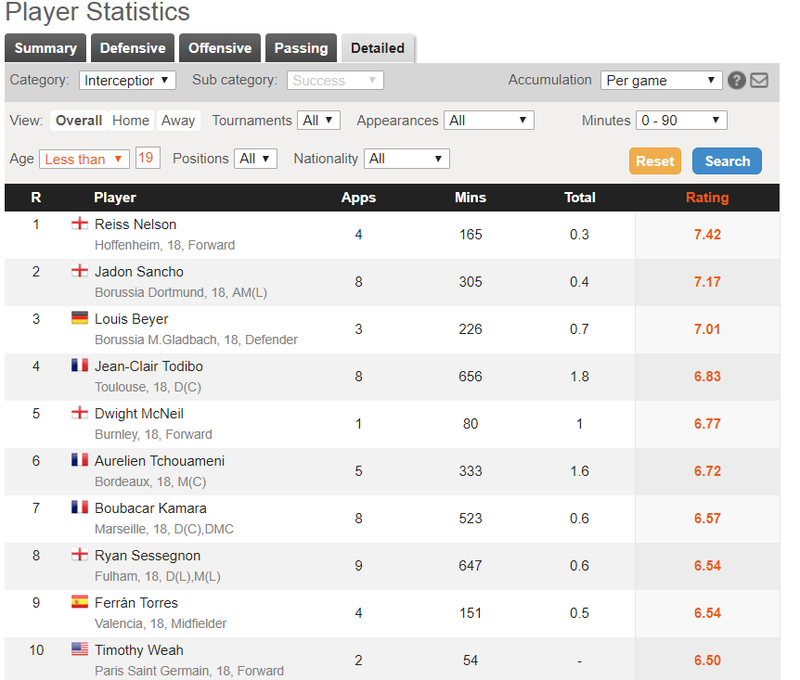 Only 3 U19 players have better average rating: Reiss Nelson, Jadon Sancho and Louis Beyer. @Pallepop: Jeremy Sarmiento has low PA of -65 and Pablo Moreno has -7, so they can't qualify. @Sunstridr: I know, but in FM19 they made him 18. @Desertik: Ibrahim Sangare has a PA of -75 which means a range between 120 and 150. Based on the average PA he'd get (135) he can't qualify for this list. However, he looks like a quality player nonetheless. @Piika: Like Sangare, Plogmann is also -75. Mohammed Amine Ihatteren is definitely 16 not 18. Hmm, No collossus Ibrahim Sangaré ..
GK - Luca Plogmann - Bremen III ? Handcrafted in Symi, Hellas. Page created in 0.624 seconds.